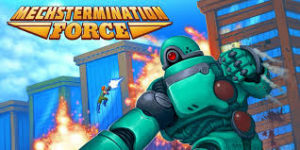 I am not certain whether or not Mechstermination Force is meant to be a parody of classic “run and gun” games, but it doesn’t really come off as one. Perhaps it is an homage to games of the eighties such as Contra where you take control of a character who can shoot and jump with no limits on your ammo. I can honestly say that I was not a fan of these “run and gun” games in the arcade or on the console. The reason why is these games are hard. Seriously, they are usually about shooting a big target that takes a lot of hits to kill it, while being shot by millions of bullets. Mechstermination Force is like that, and is very, very difficult. Mechstermination Force is all about one man versus a giant robot. I’m not certain why giant robots are attacking, as I am guessing that world building is not all important in this game. Needless to say, you play a lone soldier who has a gun as well as a guitar to smash things, and…so is this a parody or not? Well, it could be, but the gameplay is difficult, involving a lot of tricks to shoot things and bring them down. Honestly, in the few hours that I give to review games, I found it very difficult to defeat these giant robots. Each one of them is like a boss at the end of a level, only there is no level that I could find. I’m going to give this game two out of five stars. I would rate it higher, but the levels were just so dang hard. Yeah, call me a video game wimp, but serious gamers should love the challenge. Check it out on the Nintendo Switch.